There is anecdotal evidence that celery seed is good for gout, but very little research exists to support the claim. Celery has been used in herbal medicine for thousand of years to treat ailments such as arthritis, indigestion and colds. Gout is a form of arthritis. 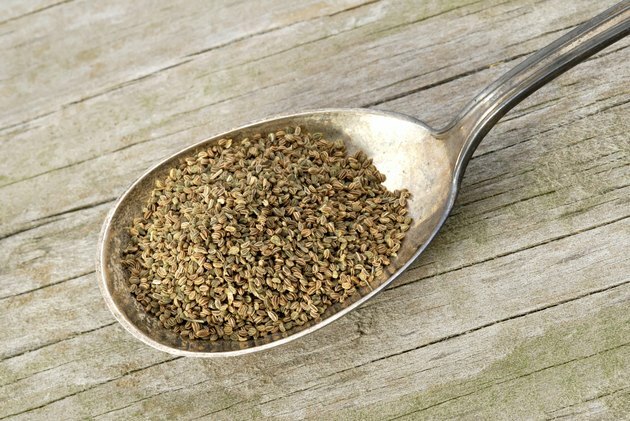 If celery seed helps to improve gout symptoms, it may be due to its anti-inflammatory properties. Do not take any supplements without first consulting your physician. Gout, a particularly painful type of arthritis, may be associated with the past, but it is a very modern disease. It is triggered when uric acid crystals build up in your joints, often in your toes. Gout can cause swelling, stiffness and a feeling of heat. Although high fat diets are associated with gout, it can also be caused by drinking too much alcohol, stress or even genetics. Gout affects men more often than women, according to the Centers for Disease Control and Prevention. Doctors usually prescribe anti-inflammatory medication and recommend lifestyle changes for their patients diagnosed with gout or arthritis. Medication helps reduce the pain and swelling associated with both conditions. Celery seed has been used as a natural treatment for gout because it has the ability to reduce inflammation and muscle spasms, as well as lower stress levels. According to an article published in the Fall 2001 issue of "In Vitro and Molecular Toxicology," celery seed oil contains high levels of sedanolide, a natural compound that possesses anti-inflammation properties. In his book, "Herbal Drugs and Phytopharmaceuticals: A Handbook for Practice on a Scientific Basis," Josef A. Brinckmann writes that several patent applications on file with the U.S. Patent and Trademark Office hint at this therapeutic use for sedanolide. Sedanolide also provides celery with its distinctive smell. Celery seed contains a chemical called 3-n-butylpthalide, or 3nB. In his book "The Encyclopedia of Healing Foods," Michael Murray writes that celery seed extract containing 85 percent 3nB can successfully treat symptoms of rheumatism, a generic term for arthritis. According to Murray, over time 3nB may help dissolve uric acid crystals. There is no recommended dosage for celery seed. Researchers must conduct additional human studies to confirm its effectiveness as a gout treatment. If you choose to take celery seed extract, take one or two capsules or tablets three times per day, or up to 1/2 tsp. three times daily. You can also prepare a tea by crushing whole celery seeds into a powder. Do not take celery seed if you are pregnant or have kidney problems. Can Drinking Cranberry Juice Bring on a Gout Attack?